This phenotypically correct and balanced Broken Bow daughter displays good calving ease. She has three recorded progeny, including M175 who sold in the 2018 bull sale. 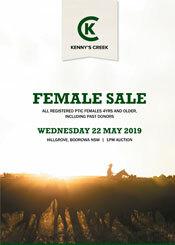 Sold pregnancy tested in calf to Kenny's Creek M1 with an AI female fetus.